St. Leonard’s is a Church of England church – one of three which work together in Horsham. You can find out about the other churches via the Links page. We are a small and friendly church family made up of all sorts of different people, but we are held together by the one very important thing we have in common – we are all loved by God and want to share our faith with those we meet day to day. We are seeking to grow and find ways of reaching out in order to make a difference to those in our local community and further afield. (For details of the charities we regularly support go to the Charities page. Several times in the bible Jesus makes invitations to the people around him to come and follow him, or come and eat, or come and rest with him. He never imposes himself, but gives us many chances to respond. Perhaps as you read this, now is the time for a new beginning? 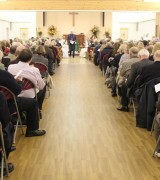 Come and see what God has in store for you, with us, at St. Leonard’s. 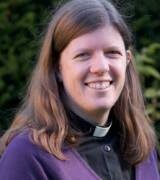 Natalie became Vicar of St. Leonard’s in 2014 and feels called to pastor the church congregation, but also to encourage engagement with all those who live in the locality. She seeks to equip each member of the church to share their faith in their daily lives. She is passionate about helping people to explore faith in whatever they face, as she knows from personal experience that having Jesus in her life makes a big difference in times of celebration, but perhaps particularly in the hard times. Natalie has two children and enjoys cooking with her son and shopping trips with her daughter. She plays in an Orchestra and enjoys Pilates. Margaret has been Reader at St Leonard’s since 1999 and has lived in Horsham more years than she likes to admit, having been a pupil at Horsham High School. She taught and was Head of English at Millais School until 1988, then Deputy Headteacher at Davison Church of England High School for Girls in Worthing. She writes and teaches occasional Theology courses for Chichester Diocese and has led pilgrimages to Lindisfarne and Iona. Margaret is keen to build up St Leonard’s as a neighbourhood Church in its area of Horsham. She is a Trustee of BEATS and an Ambassador for World Vision, charities supported by St Leonard’s. 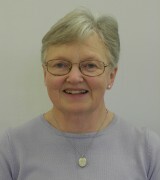 Margaret is married to Richard, a former Warden of St Leonard’s and former Parish Warden. She has three step-sons and four grandchildren.